King Neptune's Casino bonus is somewhat bland to say the least. Right now they're offering a 100 percent welcome matching bonus up to $/£/€100. Everything is based on the first deposit made when you sign up. First, you'll need to sign up and download the program. Then you need a Real Money Account. From there you can make your first deposit and King Neptune will match 100% up to $/£/€100. So, if you deposit $/£/€20, you will receive $/£/€20 in your match. This free money is only applicable to new players. Many casinos offer similar promotions to the King Neptune bonus. 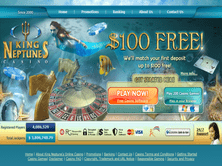 Intertops Casino, for example, offers a similar matching program up to $/£/€100. Compared to Aztec Riches Casino, however, King Neptune falls short. The Aztec Riches bonuses can go over $800, but they don't offer a matching program and you're required to make three deposits to earn their full bonus. King Neptune's Casino doesn't accept players from the United States, but the site is written in English, French and Japanese. Currently they accept EUR, GBP and USD. The site is predominantly played by UK and EU countries. The site is more popular in the UK than other regions, but Canada is a close second. The site is full of rich features and they offer over 45 table games, 41 video poker games, 20 progressive jackpots, and 133 slot games. Those who choose to download and play the game over their iPad, iPhone, Android or other mobile devices will have access to all 400 games-- while those who play in browser can access only 200. Some of the more popular games include Lion's Pride-- a fun slot game that features a jungle/safari theme. Party Island is also another popular game on the site, especially with its bright colors, easy-to-read letters, and high winnings. King Neptune's Casino doesn't list their winners on their site. Some of their jackpots, however, are over $2 million. Mega Moolah, for example, has a jackpot of $2,147,448. Major Millions has a jackpot standing at $254,162 right now and Jackpot Deuces has one resting at $38,424. This casino has been around for quite some time; therefore, they have had enough time under their belt to create a useful, user-friendly site. Their customer service is impeccable and they get great reviews for it. Some complaints, however, include their website. There is not a lot of information before signing up, so some players feel that the company doesn't disclose enough. Other than that, the company has exceptional reviews. 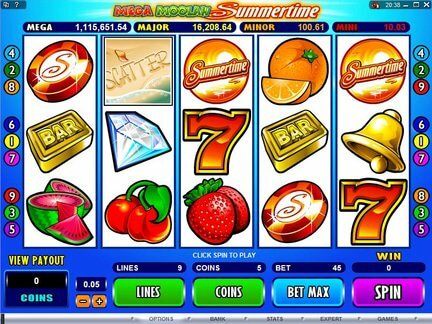 In fact, they were rewarded the Casino Player's Best of Gaming Awards in 2006 and have established a reputation for excellence online. Some comments have suggested adding a no deposit bonus or more mobile coupons and vouchers in the future, but these aren't necessarily complaints. Because of all of this, we give King Neptune a rating of 5 out of 5. The company first started in 1999. It was formerly owned by Trident Entertainment Group, but then it was sold to Belle Rock Entertainment in August of 2008. They carry the eCOGRA seal of approval and are licensed in the reputable jurisdiction of Gibraltar. They are also licensed with the Government of Malta and follow the provisions of the Lotteries and Gaming Ordinances so that they can operate online. They have a Maltese License, which is a prestigious license only rewarded to online casinos that show superior service and dependability. This is truly a casino gaming environment. Aside from the King Neptune bonus, there are other opportunities for free spins and free spin codes when you play the slots. The games themselves are fun, entertaining and rich in graphics. There are more than enough games to play and you are never sitting on the site thinking that you've run out of things to do. They have limited downtime --if any-- and the games load quickly. There are other prizes too, and some of the more progressive games can earn you ten to hundreds of thousands of dollars. They've been recognized by so many high level gaming authorities that when you gamble on the site, you feel as though you're protected. The customer service is toll-free and exceptional. When I called them they were helpful, available 24/7, and aren't pushy. The withdrawals are fast, affordable and the site offers so many ways to deposit and take money out. Because of all of this, I would highly recommend the site to anyone looking for a good gambling site they can trust.